Directions to the Trailhead: Take the Central Mount Shasta exit of I-5. Go east on Lake Street for .7 mile and follow the curve as the road becomes Everitt Memorial Highway. Go another 2.2 miles and turn left at the sign for Black Butte Trail onto a gravel road. Go .1 mile and turn right. 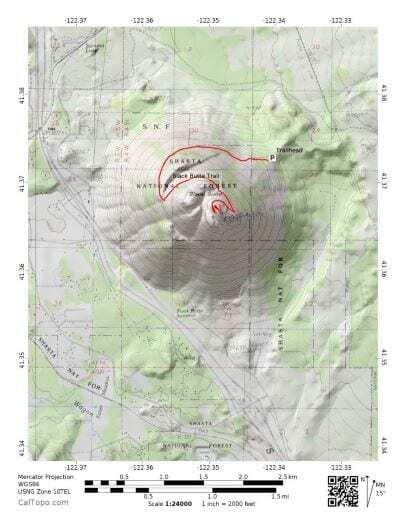 Go 1.0 mile and curve 90 degrees to drive straight toward Black Butte. Reach another road fork .3 mile farther, where you go right (north). Drive 1.2 miles and turn left onto a dirt road just after you pass under power lines. Continue the final .7 mile to the trail head. 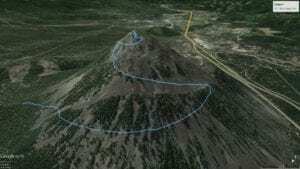 Description and Comments: The steadily rising trail begins on the northeast side of Black Butte in a mixed forest of ponderosa pine, incense cedar, white fir, and Douglas fir. It soon reaches the northern flanks of the mountain to allow excellent northward views of the Weed area and Shasta Valley, with the mountains of the Oregon border region beyond, anchored by Mt. Mc Loughlin in southern Oregon. At 1.1 miles the trail begins a southerly curve and presents excellent views of the Eddy range to the west and the Castle Crags and Trinity Divide area to the south. 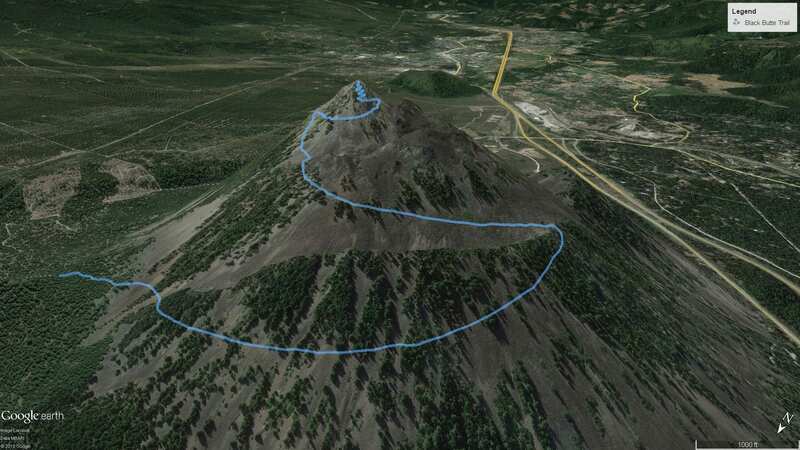 The trail then swings to the east and begins the final ascent to the summit of Black Butte. Here you add Mount Shasta to all the previously attained views.